Background: 5-Fluoro-Uracil (5-FU) ranks among the most widely prescribed anticancer agents worldwide. Fluoropyrimidines are a mainstay in the treatment of numerous solid tumors, mostly used in combination with other cytotoxics, targeted therapies or biologics. Because most of the administered 5-FU dose will undergo extensive catabolism driven by dihydropyrimidine dehydrogenase (DPD), a liver enzyme that converts 5-FU into inactive metabolite, drug dosing is particularly high in some settings such as digestive or head-and-neck cancers. Variations in fluoropyrimidine disposition are a major cause for the erratic pharmacokinetics profile observed in cancer patients. Because of the elevated doses administered, DPD-deficient patients are likely to experience lifethreatening toxicities and those are now a rising issue regarding pre-emptive strategies to be undertaken to improve safety. Numerous clinical reports and meta-analysis have investigated on possible strategies to forecast DPD deficiency, thus opening the way to preventive adaptive dosing strategies with 5-FU or oral capecitabine. Objective: This Part-1 aims at covering the achievements, limits and perspectives of current strategies to detect DPD deficiency at the bedside. Method: A Pubmed research was performed regarding genotyping and phenotyping DPD deficiency, as well as their cost-effectiveness studies, in order to discuss and compare their performance. 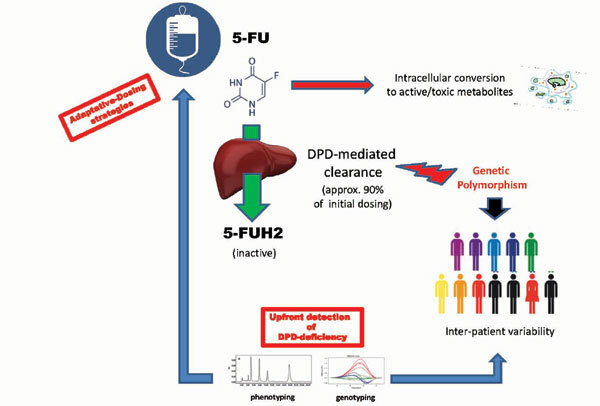 Results and Conclusion: To date, defining the best upfront method to sort patients on their DPD status remains a challenging issue because genotyping approaches show a low sensitivity with respect to the actual number of 5-FU-related toxicity reported cases, and that phenotyping approaches have several technical limitations. 5-FluoroUracil, fluoropyrimidine, dihydropyrimidine dehydrogenase, personalized medicine, DPD deficiency, pharmacogenetics, toxicity.